AU (Alternative Universe) - When you use canon characters, but change the original story; “What if they ended up together instead?”, “What if he did not die?”, “What if she left?”, “What if she had a twin?”, etc. Usually uses material from only one sours. ORIGINAL STORY CROSSOVERS - When characters from different movies/shows are used as puppets/actors in order to tell a completely new story. Does not need to be a full 3-act spectacle, but there should be a clear sense of some kind of plot (otherwise it will feel more like a shipping video). The characters are usually in no way related to their original material anymore, but are simply there to play the role of a new character. Basically: If the video had been made with the editor’s original characters, then it would have been a original short film. These two were from collab videos. Or more "MEPS"
MEP (Multiple Editor Project) - A video that consists of several editors work, usually around 6-9 different people. Each editor gets their own part of a specific song which they then have to fill, then all the parts are combined into one long video. The themes for what kind of videos everybody are going to make varies (usually decided by the MEP host) and can be anything from a regular music video to crossover shipping. This MEP was hosted by me. It was Villains x Heroins Shipping/crossovers. But with an Anthro twist. I picked Jenner x Belle. This one was hosted by a friend (this is my part) A Yandere is in love, but her crush is in love with someone else. And I did a twist. Were in my AU Nicodemus takes in two sisters, and it seems Ama (as am sure you know Ama as in last unicorn) is little to obsessive about her "father"..so she kills her sister.. Here is one a Manip I made. I turned Cornelius into Justin.. 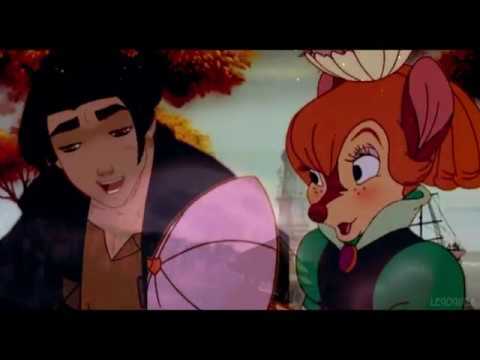 Here is another Don Bluth Rodent in a Human x Anthro ship. This is for a MEP that am hosting. This is one of my friends' parts...Am doing Justin and Thumblina. So her some love..I love her part! These crossover videos are some good pieces of art. These are all cool. Crossovers are fun. I'm amazed how they can make two different cartoon characters look like they're sitting right beside each other. What programs do you guys use?